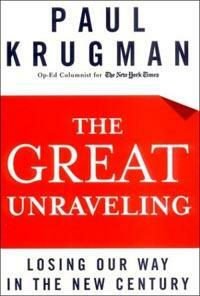 Economist Paul Krugman's new book is a collection of columns written for The New York Times. When Paul Krugman, a Princeton University professor and economist, began a twice-weekly column for The New York Times in 1999, no one raised a fuss. His prose was pretty crisp for an academic, but the subject matter was (yawn!) global trade, finance and economic policy. The U.S. economy was growing, the stock market was riding high, and life was good. Krugman served in the Reagan administration and though he reportedly had lobbied to join Bill Clinton's economic team, he was rebuffed and remained in academia. To liberals, he was hardly a beloved figure; his enthusiasm for globalization earned him the enmity of the then-untarnished Ralph Nader, and conservatives were, at best, indifferent. The Times hired him as a columnist, they said, because of his skill in making the arcane comprehensible to the masses. ``So this contractor is renovating your house. Funny how he got the job: You checked the wrong box on a confusing form, and the judge -- a close friend of the contractor -- ruled that you were stuck. Anyway, though you told him that your priority was replacing your leaky roof, he insists that first he wants to put in a luxurious powder room. Back when he was trying to get your business, the contractor said that he could put in the powder room for only $10,000, though others insisted that estimate was way too low. Now it turns out, sure enough, that it will cost at least $25,000. ''But he claims that he can save enough money on other parts of the job to make up the difference. And one of his employees has offered his personal assurance that the roof won't be neglected -- though he admits that in the end it's not his decision, and his boss refuses to put anything in writing,'' Krugman said in the column that originally ran in March 2001. And so on. Krugman's obvious talent for teaching resulted in some very sharp explications of the new administration's economic policies. More of a macro man than a micro guy, he couldn't help but analyze and illustrate the politics behind the policies. And unlike most pundits, being based in northern New Jersey rather than inside the Washington Beltway allowed him, he said, to step back and really talk about what was going on without being a part of the Washington scene. After the Sept. 11, 2001, terrorist attacks, many of Krugman's columns dealt with issues of national security and other topics beyond the scope of economics and business, angering an army of right-wing critics. Krugman's writing sharpened but never became shrill, as his academic background and understanding of economic intricacies vis vis the federal government's rising debt and its ambiguous tax policies helped cut through the fog of war and other obfuscation (deliberate and otherwise). The ongoing saga of corporate malfeasance and trickery in the financial markets are also ripe subjects for Columnist Krugman. Ignore him at your own peril. Related story: Judging a book by its cover.